At DP World Nhava Sheva, Safety is prime most important. Safety is value for us and it is our way of life. We care for everyone who is working for us at our premises and believe that their Life is important for individual, their family and for us. We have very good Quality, Health, Safety and Environment Management system implemented and follow the Safety standards laid down from DP World Head Office and local legislation. One of our major focuses is to have terminal pedestrian free as to reduce the man and machine interface. 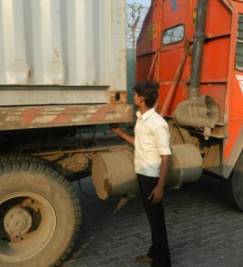 External Trailer driver’s Problem - We have observed that the external trailer drivers get down in terminal operational area with most common reason is to align their trailer twist locks to receive/deliver containers from RTG crane. Though the twist lock alignment is done at outside terminal at designated place, the twist locks due to their design and trailer travel from gate up to RTG location get turn and misalign. The drivers get down to align these turned twist lock. This is a common issue for the terminals, CFS, empty yards, transporters across the globe. 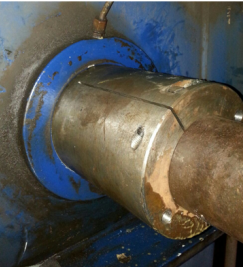 We had excellent brainstorming on this issue and tried all possible solutions of which the innovative idea of twist lock arresters worked effectively. The best solution for this problem can be converting all external trailers to have auto twist locks which need involvement from the whole trade and practical challenges to implement. We brainstormed and tried some possible solutions to arrest the twist lock so as to avoid turning and misalignment. These involved paper adhesive tape, double sided adhesive tape, glue gun, rubber cover, soft rubber cover and card board cover. Finally we got a success to design a card board twist lock arrester device which arrests the misalignment of twistlocks. We are proud to share that this is a unique innovation and first of its kind globally. The arrestors are placed at twist lock stations outside the gate. 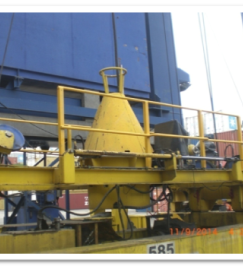 This avoid the misalignment of twist locks and thus drivers are not required to get down in operational area for alignment of twist locks before receiving or delivering the container. This a simple card board covers to arrest trailer twist locks to get misaligned while trailer is traveled from gate up to yard. A risk of driver getting down in operational area for alignment of trailer twist locks where there is heavy movement of other cranes, trailers, LMVs is reduced satisfactorily by introduction of trailer twist lock arresters. Hand rails have been provided on the RTG head frame for working safely on the head frame. 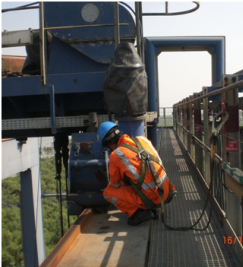 Anchor point has been provided on RTG girder as per Weight and Height guidelines for safely working on the girder. By fabricating QC trolley wheel shaft guide the uncertainty of aligning the trolley wheel shaft has been solved and the job time reduced from 24 hrs to 12 hrs.